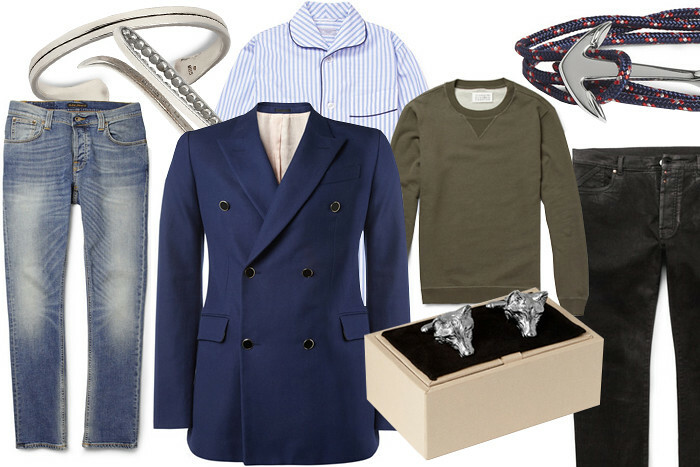 Burberry fox head cufflinks, Alexander McQueen blazer. If you put together all of this week's additions on Mr Porter you would have quite a complete selection of wardrobe staples that will work with your seasonal pieces year on year. It also included a pretty remarkable selection of what I call man-jewells. I'm not a flashy person so I've always struggled with certain menswear accesory trends over the years. However, these Foundwell pieces have an element of distinction while still being masculine and timeless. They also have a touch of vintage and a certain 20's art deco vibe, which I love. It's also about this time of the year when I add new pieces to my denim collection. I take my jeans very seriously because I wear denim every day so I need excellent quality and a great fit. Nudie is, together with Acne, my favourite brand and also I love the classic look and finish of these black Margiela ones. You can click on the links below the image to shop all the items. This week Mr P also released their latest issue of the journal, featuring a story with Chace Crawford – the jock turned businessman Nate Archibald on Gossip Girl. I love the entire shoot and the styling, which is all about velvet, my favourite texture for the holidays. You can see and shop the whole story here.